Samsung Galaxy S3 i9300 has been released at the end of May and it's been the Android best-seller since then. It came with an impressive hardware, very useful and unique features and a wonderful display. But now the company has released the Galaxy Note 2 at IFA Berlin, which is a significantly bigger smartphone, with improved specs over the Galaxy S3, though targeted to other people. While the Samsung Galaxy S3 has been unbeatable until now, the Galaxy Note 2 N7100 has the power to do it, if people can get over the size issue. If you are planning on getting a smartphone and are undecided between the two titans, then we will help you make your mind, by comparing everything. So we begin. Both devices feature a very simple design and look mostly the same, though the note is slightly bigger and can really feel bulky. But it's not necessarily a bad thing, because you can keep it much better in hand while using it in landscape mode and its huge display will definitely make a difference. When trying to make a fast call or answer and SMS you will encounter difficulties if you only want to use one hand, though it can even happen with the Galaxy S3. While the Galaxy S3 comes in Pebble Blue, Marble White, Amber Brown, Garnet Red, Sapphire Black and Titanium Grey, the Galaxy Note 2 is only available in Pearl White and Titanium Grey. Many customers have been very unsatisfied for the lack of a black Galaxy S3, which wasn't available until recently. And you will probably want a black Galaxy Note 2, though there's no information about Samsung making it available. Fortunately, the Titanium Grey looks much better than the Pebble Blue and it can fit more people's tastes. The Galaxy S3 measures 136.6 x 70.6 x 8.6 mm and weights 133 g, while the Galaxy Note 2 measures 151.1 x 80.5 x 9.4 mm, weighting 180 g. This being the biggest deal-breaker. The Samsung Galaxy Note 2 comes with a whopping 5.5-inch display, which is 0.7 inches bigger than Galaxy S3's one. 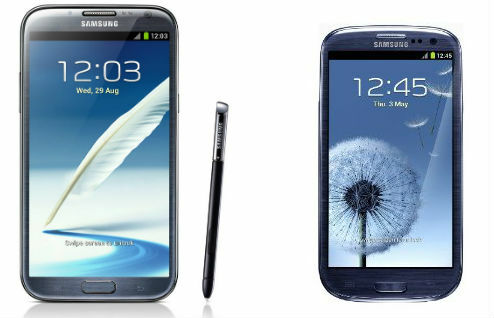 Both have Super AMOLED displays with resolutions of 1280x720 pixels, which means the Galaxy S3 has higher PPI ( 306 vs 267 ). The Note 2 has a PPI lower than even the original Galaxy Note N7000, because it comes with a bigger display and a smaller resolution. The original Note has 1280x800 pixels on a 5.3-inch display. But the PPI shouldn't be a concern, because at these levels it can't be noticed at all with he human eye. Basically these are the best displays on the market and you shouldn't worry about anything when choosing either of them. It's only a matter of size, nothing else being different. Speaking of hardware, there are considerable differences between the titans, especially on the RAM side. The Galaxy S3 comes with a quad-core 1.4Ghz Exynos 4412 processor, while the Nore 2 has the same CPU clocked at 1.6Ghz. Both sport the same GPU and the Note 2 comes with double the Galaxy S3's RAM ( 2GB vs 1GB ). RAM is very important because it keeps applications caches, so you can instantly launch previously used applications. And more RAM means that more applications can be cached without any problem. On the connectivity side there aren't huge differences, except that the Note 2 comes with 4G support ( even for the international version ) and USB Host support. Both feature Wi-Fi 802.11 a/b/g/n, DLNA, Wi-Fi Direct, Wi-Fi hotspot, though the Note 2's WiFi is dual-band. They also come with Bluetooth v4.0 with A2DP, and EDR and NFC ( Near Field Communication ). Unfortunately neither of them is compatible with the US LTE 4G network, so they feature different processors on that side of the ocean. The Galaxy S3 comes with a dual-core Snapdragon S4 CPU and the Note 2 will probably follow suit. Unlike the S3, Samsung's new phablet also features the well-known S-Pen, which can be useful in many situations, but mostly useless in most. You can use it to annotate photos, maps, take written notes, take screenshots or open additional menus by using the S-Pen's button. If you feel like having some artistic senses, then you can even try to draw something. Galaxy S3's micro SD card slot can take 64GB cards, while the Note 2 only supports 32GB ones. It's quite hard to compare the software present on the two devices, considering they will both be running the same version in about a month. Currently the Galaxy S3 comes with Android 4.0 Ice Cream Sandwich, while the Note 2 features 4.1 Jelly Bean, though the Galaxy S3 Jelly Bean update is due next month. TouchWiz UI (user interface ) is present on both devices and it's something you either love or hate, though this isn't a point of comparison, because it's 100% the same on both of them. Fortunately you can change the homescreen's UI by using a custom launcher, which can be downloaded from Google Play for free. The Note 2 N7100 also sports the motion control features present on the Galaxy S3: Smart Stay, Smart Alert, Pop up play, Direct Call and Tap to Top. We've included camera here just to tell you that both smartphones feature exactly the same cameras. They identical photos and movies, also having the same features. The 8MP rear camera can report 1080p videos at 30fps and take 3264x2448 pixels photos, while the frontal 1.9MP camera can record 720p videos at 30fps and can be used for high quality video calls. The LED flash is extremely powerful on both devices, compared to other smartphones, though it's mostly good as a flashlight, because it's definitely not enough for taking photos in the dark. There's some talk on the battery side. The Galaxy Note 2 packs 1000 mAh more than the Galaxy S3 ( 3100 mAh vs 2100 mAh ), though it has a bigger display and slightly powerful CPU. It's pretty hard to make a perfect comparison between the two of them, though personally I would declare the Galaxy Note 2 a winner. 50% more juice for a 17% bigger display and 13% more powerful CPU should definitely turn it into a winner. And considering that during standby the display and processor doesn't matter, it can have a lifetime 50% longer, theoretically. It's hard to write a conclusion, even if the Note 2 won most of the comparison, because, like I said above, they are nearly identical devices, except the size. You won't notice any speed difference between the Note 2 and Galaxy S3 and by the end of September both will feature the same operating system. So if you want longer battery lifetime and a bigger display, Galaxy Note 2 is your pick. But if you prefer a smaller device, then it's a no-go. Easy to take screenshots with the note 2. Just swipe your finger across the screen. You jmight wanna mention the Note 2 has unbelievable bad brightness. Note 2 has better camera (or brighter lens). More dynamic range, better colors in dark scenes, absolutely better reproduces skintones, it measure white balance precisely. Shouldn't it be a tie between both in terms of software?